I was hanging out on 15th Avenue the other day near Volunteer Park when I was struck with an urge to shop. But where does one go from 15th? Downtown, sure, but you have to take the bus. I was not in the mood for a long walk. I made my way past Coastal Kitchen in the direction of QFC, when I found something peculiar: a consignment store nestled between the Dollar Store and Salon Ciba. I had never seen it before and was impressed by the window display. Naturally, I couldn’t resist giving it a try. I came out two hours later with a pair of Prada (I know, right, Prada!) heels in my purse and a leather jacket on hold. May we please take moment to appreciate the fact that I am now in possession of Prada shoes for a mere thirty-two dollars? The woman who had owned those shoes initially might have paid a thousand dollars! And what did I pay? THIRTY-TWO. The little maroon storefront across from Coastal Kitchen harbors an overwhelming collection of designer intermixed with the unbearably cheap. Take 2 only accepts clothing that is less than three years old, meaning everything is up to date, and most of the merchandise, with the exception of a Prada bag ($288) and a satchel from Michael Kors ($125) are under one hundred dollars! Granted, a few of the items are for the older crowd and it can be difficult to find something that fits (there’s a reason people chose to consign some of the items), but overall, I definitely recommend Take 2 on Republican and 15th. This entry was posted in Seattle, Teen Powered and tagged fashion, written by teens on August 10, 2010 by Teen Blogger. This… ‘stuff’? Oh… ok. I see, you think this has nothing to do with you. You go to your closet and you select out, oh I don’t know, that lumpy blue sweater, for instance, because you’re trying to tell the world that you take yourself too seriously to care about what you put on your back. But what you don’t know is that that sweater is not just blue, it’s not turquoise, it’s not lapis, it’s actually cerulean. You’re also blithely unaware of the fact that in 2002, Oscar De La Renta did a collection of cerulean gowns. And then I think it was Yves St Laurent, wasn’t it, who showed cerulean military jackets? I think we need a jacket here. And then cerulean quickly showed up in the collections of 8 different designers. Then it filtered down through the department stores and then trickled on down into some tragic casual corner where you, no doubt, fished it out of some clearance bin. However, that blue represents millions of dollars and countless jobs and so it’s sort of comical how you think that you’ve made a choice that exempts you from the fashion industry when, in fact, you’re wearing the sweater that was selected for you by the people in this room. From a pile of stuff. 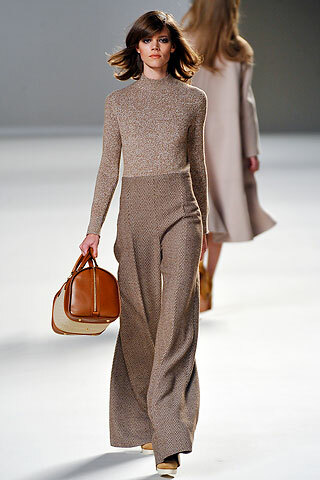 A piece from Chloe’s 2010 Fall Ready To Wear collection. Now, operating under this pretense – it looks as if the skinny jean may soon have a competitor – the flare. Not only have celebrity magazines been tracking style-savvy Hollywood starlets rocking the bohemian inspired look, but runway designers have begun to adopt the look into their shows after many seasons of skin-tight trousers. There is no doubt that skinny jeans will always have a special place in all of our hearts, and they won’t go out of style immediately (the channels of the style can move slowly), but it seems reasonable that the flare pant/jean will soon become the latest trend, and the skinny jean may drift into obscurity. Pursue your love of fashion and design with this handy book at the library. This entry was posted in Movies, Teen Powered, Tidbits and tagged fashion, written by teens on May 17, 2010 by Teen Blogger. Have you been in Capitol Hill or Downtown and noticed someone taking pictures of passersby? If so, you may have witnessed someone who is taking part in the widely growing trend of style blogging. Street style blogs are being recognized everywhere as a new way for avid photographers to capture inspiring fashion in action. Most people can’t help but be intrigued by fashion; seeing someone in a strange or creative ensemble will always inspire curiosity. The world of blogging has tuned into this fascination and the result is that hundreds of style blogs have been created all over the world. Some of the more prominently known style blogs include style.com, Jak & Jil, FaceHunter, and The Sartorialist, but there are also several blogs that are based in and focus on Seattle (needle +thread being one). While Seattle may be famous for its love of Birkenstocks and Polar Fleece, I happen to believe that we must be turning over a new leaf. Having perused the blogs of several Seattle-based bloggers, it’s clear that some people in Seattle have broken away from the well-known stereotype of sandals and socks. Even if you think you have no interest in fashion, style blogs are definitely something to be checked out. If you do take an interest in fashion you will be interested by many of the candid shots put forth by budding photographers. But if you don’t think fashion is worthwhile you will at least be entertained by the sometimes odd ensembles featured on these blogs. The idea of capturing unique and creative style has also translated into the creation of several books based on street style. 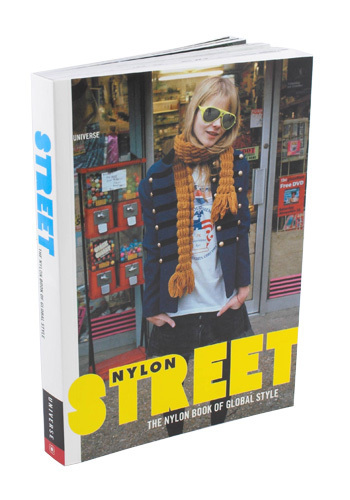 One that is at your Seattle Public Library is Street: the Nylon book of global style. This book, created by the fashion pioneers at Nylon Magazine, highlights cities all over the world that inspire major fashion trends and includes photographs to demonstrate. However, if this is not enough to satisfy your hunger for street style, The Sartorialist by Scott Schuman (also available at Seattle Public Libraries), and FaceHunter by Yvan Rodic have both been recently published. This entry was posted in Blog Love, Teen Powered, Tidbits and tagged fashion, written by teens on April 29, 2010 by Teen Blogger. Through all the major blockbuster movies these past couple of months you may have missed one smaller scale movie. Chris Rock did a documentary called Good Hair which covered a largely overlooked element of African American culture: hair style. The documentary was a comedy that looked at the black hair industry (yes, it is its own industry). The whole idea for the film was started by Rock’s daughter who asked him one day why she didn’t have “good hair.” The definition of “good hair” for most black women is straight, long, and flowing. Unfortunately, the two most permanent ways that this can happen is with a chemical called a relaxer or with someone else’s hair in a weave. Both methods are costly from both your time and money. Chris Rock went to beauty salons all over the nation talking to women getting their hair done, almost all of whom were getting their hair relaxed. They told Rock that they are on the “creamy crack” because you have to keep using relaxer as your hair grows out. The most eye-opening part was when he talked to a three-year-old girl getting her hair done. Rock asked her if his daughters should get their hair straightened and the little girl gave him a funny look and said “Yes! Cuz you’re supposed to.” At such a young age she already had an idea of what is beautiful hair. This entry was posted in Movies, Opinions, Teen Powered and tagged fashion, written by teens on November 26, 2009 by Teen Blogger. Do you love fashion? Want to make a living pursuing your passion after graduation but need to know how to get started? Can’t decide if you want to design, photograph, model, or style? Or do you have a flare for hair? All your questions will be answered by a panel of professionals full of inside knowledge and advice. This is our first program in the Nextworking series – which focuses on getting you connected with professionals! We are hosting a free event at the Central library, May 17, 2-4 p.m., to which we’ve invited professionals working in the fashion industry to talk about how they got their start in the business and answer teens’ questions about the ups and downs of their jobs. This just in: we’ve learned that one of the panelists will be Dean Zulich, a photographer who was a runner-up on the VH1 reality show “The Shot” and whose work has been published in dozens of magazines. This is a unique opportunity to talk directly with someone who immigrated to the U.S. from Bosnia and found success doing what he loves: taking photographs. This entry was posted in Employment, Events, Free Stuff, News and tagged fashion on May 15, 2008 by pushtotalkteens.